Fun in the sun is part of the California lifestyle, and playing in the water at the beach or in a pool is a favorite pastime. Every summer, adults and children flock to the pool, whether at a public facility or in their own backyards. Unfortunately, few realize how dangerous swimming pools can be, until tragedy strikes. Every year, more than 1000 children die in pool, swimming, and diving-related accidents, and numerous near-drownings lead to permanent disability. If your child has suffered brain injury or death as a result of an unsecured pool, our swimming pool injury lawyers in San Marcos can represent you and hold the negligent property owners accountable for the injuries that they caused. Please contact The Rubinstein Law Group today for a free initial consultation with an Oceanside brain injury lawyer. In many cases, these hazards can be reduced if a property owner takes appropriate precautions, and failure to do so may be grounds for a premises liability lawsuit. 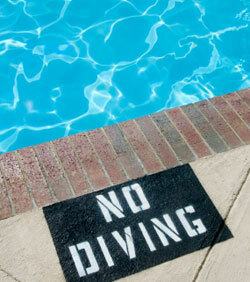 Some of these rules apply not only to swimming pools, but to other places where children congregate to swim. Construction sites, mines or quarries, even sinkholes may fill during rainy months and become popular but dangerous swimming areas for local children. If a property owner fails to take steps to keep children out, he or she may be responsible for injuries suffered. If your child’s injury or death at a public or private pool could or should have been prevented, you may be entitled to receive compensation. Compensation is important if your child suffered brain injury as a result of a near-drowning and needs lifetime care, but is also important to call attention to the dangers of swimming pools. Your claim or lawsuit may save another child’s life. You should speak with a personal injury lawyer in San Marcos today. To learn more about swimming pool accident lawsuits, and whether you have a case, please call or email The Rubinstein Law Group today. We are near clients in Oceanside and surrounding areas of San Marcos, Carlsbad, Escondido, and Vista, but if you need us anywhere in California, we can come to you.